Strong arms aren't built with fancy techniques. They're built with hard work and intense training. Try this video workout and see for yourself! Life isn't always fair. Losing 50 pounds of hard-earned muscle and living with chronic pain isn't fair, but fair is just another four-letter word that starts with "f." I didn't choose to be critically injured, but I don't use my injury as an excuse. Your life and your body are what you make of them. Today, we're going to make a pair of badass arms. This workout, like any other, is more mental than physical. Training is about your ability to tune in to your body, focus on each and every single rep, and make every one count. That's where growth occurs. When you're uncomfortable, and it hurts, you force your body to adapt. Believe me, this workout will force your biceps and triceps to adapt. I don't really like to rest; I like momentum. When I do these supersets, the intensity is high and my heart rate is elevated. I want to build muscle and burn fat at the same time. Too many times I see people go to the gym and just check sets off their lists. Make sure you train with focus and intensity. Push yourself out of your comfort zone. If you hit a wall, rest-pause, shake it out, and get right in your head again. 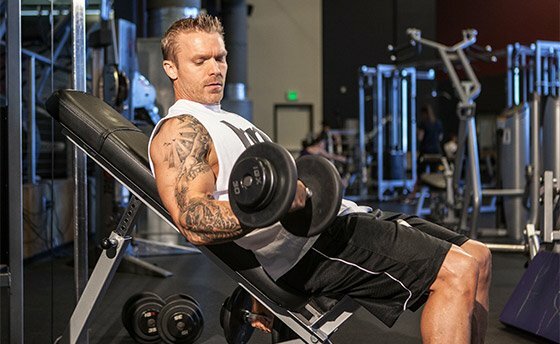 "Each superset begins with a biceps curl and finishes with a triceps extension." I then warm up with chin-ups to prime my biceps and push-ups to prepare my triceps. I don't do them to fatigue—just enough to stimulate the muscle. In between the push-ups and pull-ups, I do some light stretching. Don't take your warm-up lightly. Injury is no joke, unless you want to take a couple months off from training. There's no need to jump in too fast, because trust me, we're going to kill the workout. ASK THE MASTER MOTIVATOR: "HOW CAN I MOTIVATE MY SIGNIFICANT OTHER TO WORK OUT?" All too often, life partners don't commit to being gym buddies. It doesn't have to be that way. Learn how to motivate your spouse to spot you in life and in the gym.